Country Life Maxine’s Menopause Supplement contains multiple ingredients, which not only regulate hormonal imbalance which occurs during menopause, but also supplies the body with essential vitamins and minerals that it requires to maintain its health. Vitamin E – Prevents hot flashes and reduces vaginal dryness. Also important for the health of the heart. Vitamin B6 – Keeps the cardiovascular system healthy. Pantothenic acid – Relieves anxiety and tiredness and restores energy. Calcium – Essential for maintaining bone density. Phosphorus – Helps keep bones healthy. Magnesium – Helps in proper absorption of calcium and keeps bones healthy. It also reduces occurrence of hot flashes and night sweats. Alfalfa – Reduces hot flashes, anxiety, moodiness, vaginal dryness and decline in sexual appetite. L-Tyrosine – Helps curb night sweats, depression and also prevents weight gain. Motherwort – Reduces moodiness and irritability. Chaste berry extract (vitex agnus castus) – Increases progesterone levels and reduces prolactin production, bringing balance to the body’s hormone levels. This helps keep menopause symptoms like hot flashes and night sweats in control. Red clover extract – Contains phytohormones that balance the body’s hormone levels and decrease the occurrence and intensity of menopausal symptoms. Licorice extract – Tonic for pancreas and rich in antioxidants. Helps delay ageing. Black cohosh extract – Contains isoflavones, which are plant hormones that act like estrogen and reduce menopause symptoms in the body. Suggested daily dosage is 2 capsules a day with food. Women who are on oral contraceptives, Indinavir, or other protease inhibitors should not take this supplement. It is also not recommended for pregnant or lactating women, or those with high blood pressure. The listed retail price per bottle is $19.99 but it is available on websites like Vitacost for $11.99. The company does not offer any money back or return policy. However, it promised authentic, clean and fresh ingredients, consistency of formula, and accurate labels. The supplement is made following certified GMP and sustainable manufacturing practices and all ingredients are certified as organic. 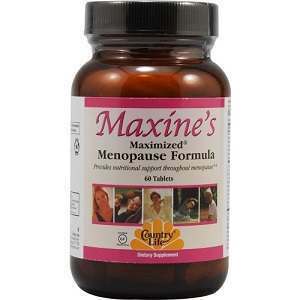 This is a good, natural supplement with many active ingredients and a multi-directional effect on menopause. Jackie Horowitz	reviewed Country Life Maxine's	on September 18th	 and gave it a rating of 2.